Our Bean business has seen some major changes over time and remains an important part of the L.A. Hearne Company product mix. Currently we are the major supplier of top canning quality large lima (butter) beans in the world. We receive our product from growers in the Coastal Valleys of California from Morgan Hill in the north to Camarillo in the south (approximately 330 miles in length). California is the only state in the United States that produces large limas commercially due to their extremely long growing season and the bean’s sensitivity to high humidity. The coast of California’s weather, due to its dry warm days and cool nights mixed in with morning fog in the fall, creates the perfect climate for superior quality. It is our goal to be the best supplier of large lima beans in the world. Our large lima beans are mainly consumed in the southern United States, along the eastern seaboard, and in the United Kingdom. “The West” tends to maintain a spicier palate and leans towards colored beans (pinks, pintos, blacks, reds, etc). If you are game give Francis’ spicy version of the good ole butter bean a try – you won’t be disappointed! Link to recipe (Large Limas file) or try the Quick and Easy recipe – both will get you eating these flavorful legumes. We also handle other varieties in small quantities such as King City Pinks, Santa Maria Pinquitos, Pintos, Garbanzos, and Peruanos. Through CCOF we are a certified organic conditioner and sell organic product. 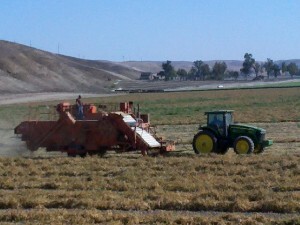 Our Bean Division also includes custom field operations such as planting, cutting, windrowing, raking, and harvesting. Our main receiving and cleaning facility is in King City, CA at 512 Metz Road. © 2016 Hearneco. All Rights Reserved.